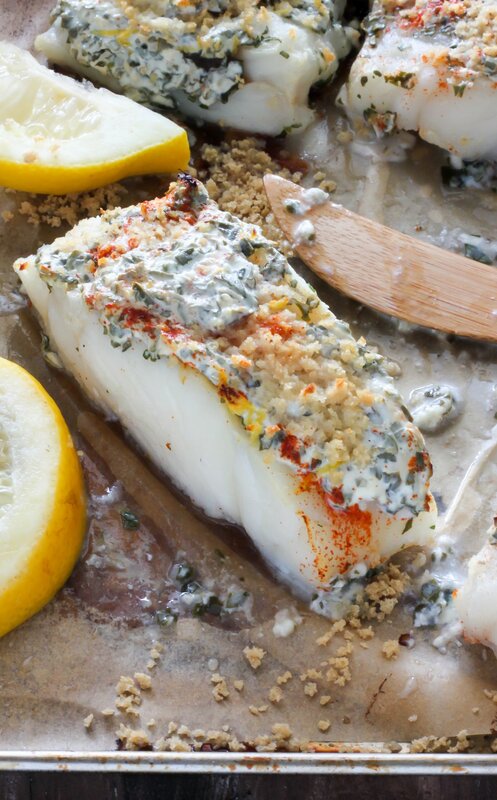 This 20 Minute Lemon, Garlic, and Herb Baked Cod is fresh, flavorful, and fast! Perfect healthy dinner option for any night of the week. We cook a lot of fish at our house. It’s not just an occasional thing; it’s a couple of times a week… at least. I especially love cooking cod often because it’s one of those ingredients you can go as basic or as flavor crazy with as you please. 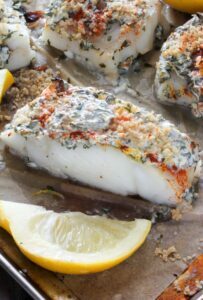 For this recipe I’ve teamed up with Alaska Seafood to bring you a quick, flavorful, and super easy 20 Minute Lemon, Garlic, and Herb Baked Cod. This recipe is so easy to throw together – even on those nights when you really don’t feel like cooking (!!!) – and just bursts with healthy, fresh flavor. We like to pair it with brown rice and salad for a light yet hearty supper. I think couscous or quinoa would also pair wonderfully with this flavorful fish. Alright so let’s talk about what makes this fish the flavorful powerhouse it is. Our ingredient list includes olive oil, whole wheat panko breadcrumbs, Greek yogurt, Parmesan cheese, fresh parsley, fresh basil, garlic, lemon, salt, pepper, and paprika. If you’re a little freaked out by the idea of fish and dairy (the cheese and yogurt) – don’t be! I promise it melts into the fish beautifully and tastes incredible. Whoops! Forgot one very important ingredient in the list above: THE COD. I used Alaska frozen cod for this recipe which I easily swiped up at our local grocery store. I love fresh fish, but frozen fish can be seriously convenient! I also loved that the cod was already cut into fillets, making my job even easier. Are you familiar with Alaska Seafood? It’s the best. Alaska produces seafood with a delightfully firm texture and superior flavor that is full of high quality protein, vitamins, minerals and oils essential to good health. With five species of salmon, several varieties of whitefish, and numerous shellfish species, Alaska offers mouthwatering seafood options for every taste and cooking method and is available fresh, frozen and canned year round. Alaska seafood is high in protein, low in saturated fat, low in sodium and one of the best sources of heart-healthy omega-3 fatty acids. In a nutshell, Alaska Seafood is all of the things you want in a fish company. 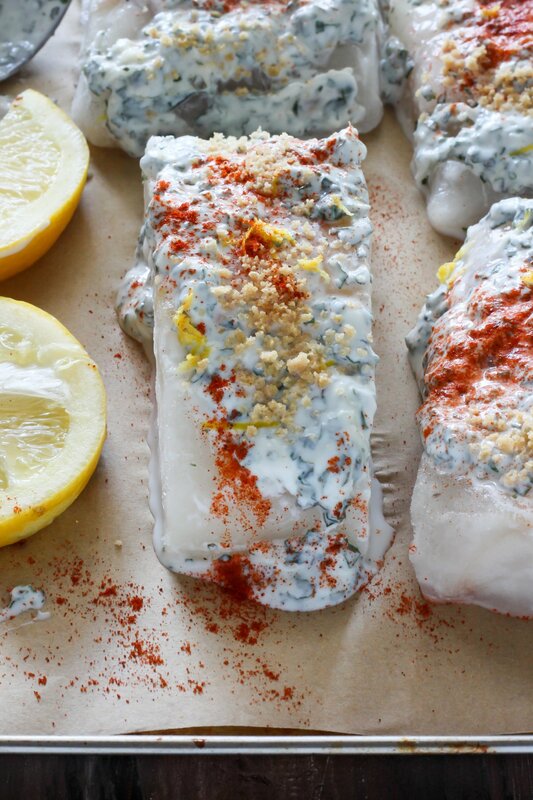 Baked Cod loaded with lemon, garlic, and herbs! This healthy meal is so moist and flavorful. Ready in just 20 minutes! Preheat the oven to 400 degrees (F). Line a large baking pan with parchment paper; set aside. In a small bowl combine the olive oil and breadcrumbs, toss well to coat them evenly in the oil; set aside. In a medium-sized bowl combine the Greek yogurt, Parmesan, parsley, basil, garlic, lemon zest, salt. paprika, and pepper. Spoon the yogurt mixture on the tops of each fillet and spread it around with the back of the spoon, then press the panko crumb mixture on top of each fillet. Place fillets on prepared baking dish, crust-side up. Bake until firm, about 12-15 minutes, depending on the thickness of the fish. Serve with reserved lemon juice. This looks so quick and so full of flavour! Definitely going in the weekly rotation! This cod sounds amazing! Love the intense flavors of the yogurt and herbs with tender white fish. I can’t wait to give it a try. This fish looks so delicious, love the yogurt sauce!!! We cook A LOT of fish too..and always Alaskan! I am loving that you used Greek yogurt in this dressing….I am deffffs going to be shoveling this into my face in the near future! Pinned! 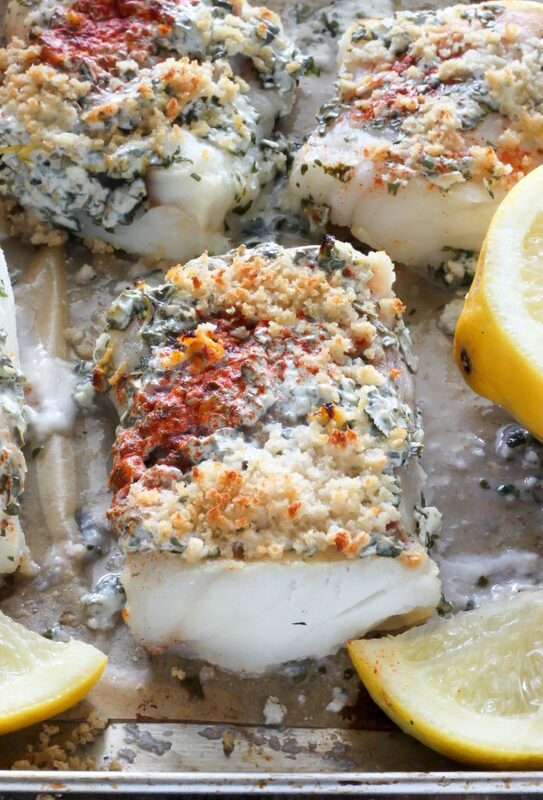 This cod looks so flavorful! Such a yummy dinner recipe. Rich is always asking for cod from his Boston days!!! Love this version! Could some please just make the recipe before commenting. We obviously all have eyes and can SEE it, but how does it TASTE ? Agreed! We need to know how the dish tastes! Hi HLH. If you read the other comments quite a few folks have reviewed the taste. Thank you!!! I get so tired of people telling how good something looks!!!! Like you I also can see that something looks good…but how does it taste?!!!!! That’s what I want to know!!! Thank you for this recipe. I’m always looking for new cod recipes to try. I was apprehensive of the yogurt But the other ingredients sounded delicious So I went ahead and tried it. The recipe was easy & fast. It was good & will make again. My family clean the pan. Cara Ann, did you make the recipe? This yogurt sauce makes an AH-mazing dip by the way. I had extra and just scooped it up with some sourdough bread. this is seriously the best recipe for any white fish. I’ve tried it on halibut and sea bass delicious. I’m watching my fat so used nonfat yogurt and it worked just fine. Hi Anne! 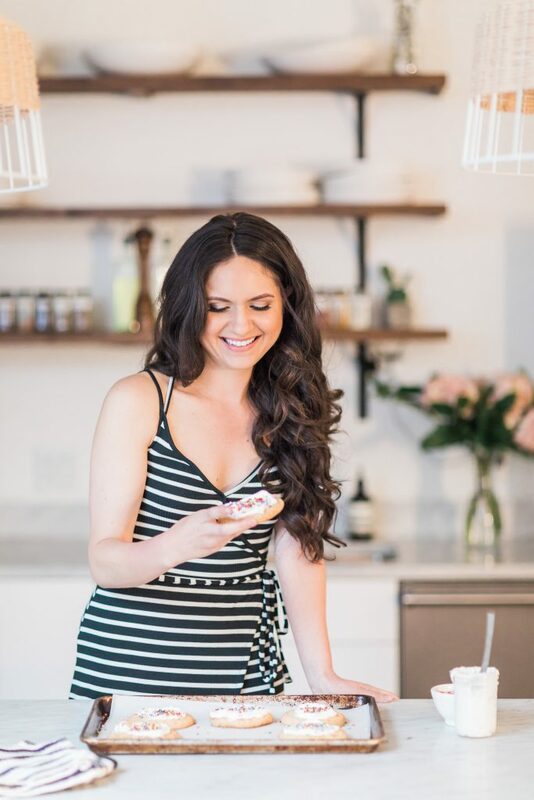 I’m so so happy to hear you enjoyed this recipe 🙂 It’s one of my favorites! I tried this last night & it was such a hit in my household! Delicious! Thank you! Btw, what is the calorie count? Awesome! Hope you love the recipe as much as we do. Hi there! I took down this recipe yesterday and accidentally got fat free Greek yogurt rather than full fat. Will it still come out okay? Hi Jennifer. I’ve never tried making this with fat-free Greek yogurt, but I think it should work OK. I made half the recipe since we only had a one pound filet. Still had way too much panko crumbs. I question the quantity in the recipe. It coated the top completely not like the pics here. But in any case, it was delicious. 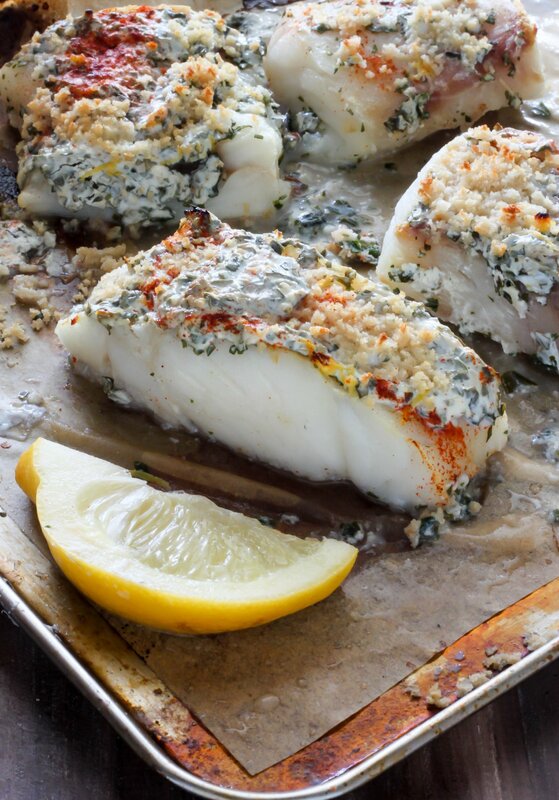 It looks great and I am going to make it tonight, my cod is thawed out…. Was your time and temp for frozen? Do I thaw out the cod or prepare it from frozen? I did not thaw my fillets, but you may. Just keep an eye on the bake time, as it may decrease for unfrozen fish. This dish looks interesting, but I’m wondering how assertive the Greek yogurt is. I don’t really like Greek yogurt so I don’t know how I would feel about it…melted…over fish. Is there any sub I could use or should I just omit it entirely? Thanks in advance. Hi Kelsey. You could probably use sour cream or even mayo… but if you don’t like the idea of Greek yogurt on your fish, those may sound unappealing as well. I have never tried this recipe without the Greek yogurt, so I’m not sure how it would come out if you omitted it entirely. I don’t find the yogurt flavor assertive. I tried it tonight without the yogurt and it was delicious! Also, I used dried basil, no parsley and bottled lemon juice. Yummy! Making this tonight!!! Gonna use lite EVOO mayo since I don’t have yogurt. Can’t wait to try it!! Thanks for sharing! You’re very welcome, Jane! How did it turn out with the EVOO mayo? It was totally DELISH!! Hubby looooved it !! I made this with a few changes using what I had at home. I used sour cream because I only had vanilla Greek yogurt- and I knew that wouldn’t work;) I had lemon pepper bread crumbs and no panko crumbs. And I didn’t have a lemon so I left it out. Still loved it! Very good flavor and will definitely be making it again! So happy to hear it, Suzanne! Outstanding all the flavors went together so well! !Thanks for sharing!! STOP WITH THE BORING STORIES!! Nobody cares. Just post the gd recipe. If you’d prefer to not read the post, just scroll to the bottom of the post and get the recipe. Not hard. If you don’t know much about seafood for fishing, please don’t assume that Alaska seafood is unique. Cod is a highly migratory species, halibut less so, tuna move across the oceans. You can’t make blanket assumptions that all fish from Alaska are high in protein, the level of protein depends on the species. As a commercial fisherman and professional chef, I know what I’m talking about. No need to insert in accurate facts in a good recipe just to score points with the sponsor, makes you look silly. Swap the yogurt for mayo, glaze with the sauce, then dust with Panko, don’t mix the Panko in. 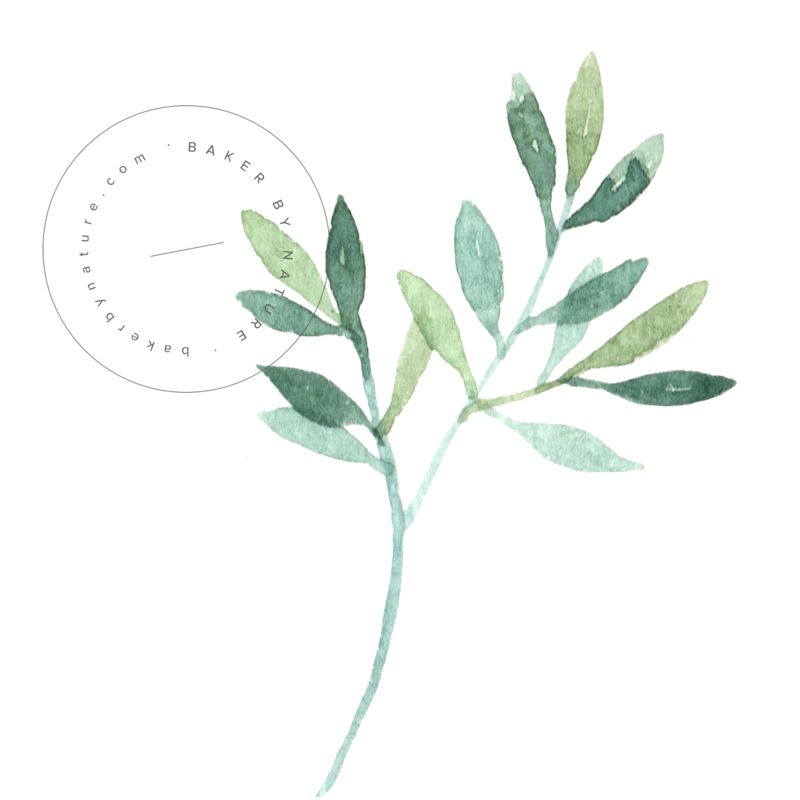 Keep your herbs less pungent, they can easily overwhelmed mild fish. You can also swap shallots for the garlic if you find the garlic overpowering. Fish should be thawed and finished with a quick broil. If frozen, you need to kick down the temperature a little bit and lengthen the cook time. Holy crimeny. She started out by saying she teamed up with the company Alaskan Seafood for this recipe. I’m not a blogger or food prep person of any sort, but I suspect the information she provided could have been straight from their website. For all either of us knows, this wording may be required to even include their company name in her blog. Just out of curiosity, I did check out the company website and much of her information provided is nearly straight from that. As far as her preparation technique, she also states to put the panko on top and not mix in so you actually agree on this point. Please, in the future, do not reprimand someone for sharing a recipe. Everyone has different tastes. One is not better than the other. You, sir, are the one who looks silly, in my opinion. I made this recipe tonight and it was almost inedible. The lemon zest over powered the dish SO much, I can’t even imagine if I added the lemon juice. This was one of the worst things I have ever made, maybe I missed a step in the recipe but I can’t understand how people have enjoyed this dish. I’m not a fan of Greek yogurt but the sauce was a hit! However, my advice if you are not using this brand of fish is to double check how your brand should be cooked. I made a rookie error and realized my fish was still frozen on the inside. Trying again tomorrow! So happy you gave the sauce a try, Katie! I’ll definitely add a tip about the cook time, too. Thanks! So, I’m ridiculous for asking BUT are you talking 8 ounces total (4, 2-ounce portions) or 8 ounces each (total of 2 lbs of fish)? I did improvise, used fresh dill in place of basil, used part olive oil mayo with sour cream in place of greek yogurt, because that’s what I had on hand, and baked mine for about 20 mins. Not that they were that thick, just wasn’t getting up to temp of 145 degrees. My boyfriend was so impressed and absolutely loved it. He even said keep this recipe handy. So glad I came across this recipe! I was so hungry for fish and this one fit the bill!! If you are tired of your fish with just lemon and garlic, take it to a whole other level with this recipe you won’t be disappointed!! Did anyone actually try this? I cook often and followed recipe to the tee. It tastes horrendous. Too tart and yogurt and fish dont go well together. This is absolutely delicious! I could eat this every day. This recipe is so good!!! My husband said he could eat it every night and my kids, who say they hate fish, couldn’t get enough! Delicious! Thank you! I’m planning to make this and have everything, but the panko or breadcrumbs. Has anyone tried it without them? Just made this and paired it with Jacques Pepin’s Peas & Artichokes for dinner. Absolutely amaryllis! The squeezed lemon wedge at the end – superb! Thank you! Made this tonight for dinner my husband and I gobbled it up! The intense lemon herb flavor is amazing! I used a baby halibut bc my local fish market didn’t have cod. Will definitely be making this again! Thanks! Can you please post the nutrition info for this recipe? I made this with the prepackaged cod fillets I found in the freezer sections and they took more than double the amount of time the recipe suggests. Were still frozen solid in the middle after the initial 15 min. HOWEVER once they were finally done- absolutely delicious!!!!! This was really tasty! I’m so sick of white fish (it tends to be dull) but eat it to be healthy, and this was a delicious way to prepare it. Anything but bland! And very easy. Thanks for sharing 🙂 I’ll definitely make it again!